The issue of digital divide is often a major barrier for the grassroots practitioners in the developing countries who fail to use the evidences effectively to influence change for the benefit of the marginalized. With a view to uphold its mission of nurturing, strengthening and promoting collective knowledge and skills; developing and implementing different practitioner and peer led learning strategies, COPASAH kickstarted its three day COPASAH- South Asia Sharing and Documenting Information Communication Technologies (ICT’s) Experiences Workshop at Vadodra in Gujarat (India) from July 2, 2015. The Day 1 of the workshop witnessed participation of 32 community practitioners from six states of Tamil Nadu, Karnataka, Uttar Pradesh, Madhya Pradesh, Gujarat and Maharashtra where the practitioners outlined experiences of using ICT for social accountability in health. The Day 1 also witnessed orientation to the skill of film making. Capacity building of 30 community level health accountability practitioners from five states and one state (Gujarat) respectively was done using accessible technology like cameras in cellphones, basic cameras on how to take videos, photographs, make photostories and record voices for identifying gaps in health care services and generate evidence for advocacy of health rights in two workshops conducted in Bhopal and Gujarat respectively in January and April, 2015. Subsequent to these workshops the practitioners developed an action plan to generate evidence using accessible technology in 18 districts on selected themes of women’s health and those of marginalised communities for accessing free health services and health rights. Photo documented evidences in terms of Photostories/Photovoices on gaps and situation in the health facilities and services were collated, reviewed and shortlisted in collaboration with community members and were used for advocating with concerned health officials and committees related to grievance redresses through public health dialogues at various levels of health system. These phtoto documented evidences were created as AV products. On the first day of the workshop practitioners from the six states presented and discussed in detail the experiences of using ICT in the selected areas and on themes selected. The presentations revolved around the context of the place where ICT was used, the detailed process- on how and which issue was selected, and the kind of ICT which was used including Photographs, videos, voices, voice recordings and how community members were involved in the process. The presentations also revolved around how the production process was taken ahead in terms of how photographs/videos were taken, instruments used, the conceptualisation of phtostories/ photovoices. The presentations also witnessed the of dissemination/advocacy process, responses from different segments including health service providers, besides focusing on outcomes and challenges. COPASAH’s initiative of using Photovoice methodology for social accountability for the first time. 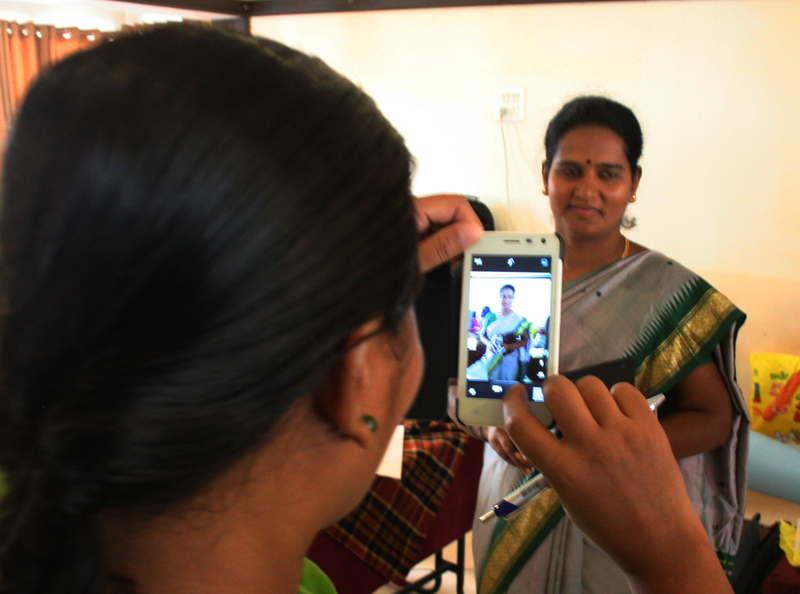 2) It emerged from the discussions from all states predominantly, especially from Tamil Nadu, Gujarat that community members were enthusiastic to take photos and community can handle technology, work towards generating evidences for health gaps but were not much involved in analysis, review, selection and conceptualization of photostories. 3) It discerned from all the states that as compared to traditional report cards in Community Based Monitoring the photovoices have emerged to be strong mediums of reflecting gaps in delivery of health services and health rights denials. 4) From the state of Madhya Pradesh, it came to surface that there were two different responses to use of ICT in CBM in two different contexts (districts) of Chindwada and Morena. In Morena the service providers were supportive and supported the use of evidence as presented in health level dialogues, however there was much resistance and backlash from service providers in the Chindwada district on the evidences generated using Photovoices on gaps related to health services. The practitioners highlighted that what emerged as one of the reasons besides other factors for the variance is the context of the two districts. Chindwada is dominated by Dalit communities and it is easier for the higher caste service providers to suppress the voices of the deprived, whereas Morena is dominated by higher caste people. Positive responses to use of photostories as evidence emerged from states of Gujarat Tamil Nadu, Karnataka, Uttar Pradesh as according to the practitioners it led the marginalised community to negotiate for health rights. 5). All the practitioners outlined that time constraint has been a limiign factor in the process of carrying out the initiative. · We have the hypothesis that Photovocie methodology is useful but it needs to be pulled out from the experience of using ICT for social accountability as to what is the value addition of ICT in CBM while involving local community members. · The issue of consent also needs to be addressed. COPASAH Secretariat coordinator, E Premdas Pinto noted that the practitioners had actively pursued the COPASAH initiative of using ICT for social accountability; however he cautioned that the idea of community should not be romanticized. It should be realized that the bottomline of the CBM is community and empowerment. It should be nuanced that who is the closest to the community i.e the grassroot worker and they should be involved in the bottom up approach of CBM. The Day 1 of the workshop ended with screening of a documentary ‘The War Photographer’ which was showcased by independent film maker Vijay Kumar, to orient the practitioners about the ethical concerns and the issue of seeking consent in situations of conflict. The film screening was a curtain raiser to the skill building session on film making which will be Day 2 of the workshop.